Can I Use An Extension Cord With A Space Heater? QUESTION: Is it safe to use an extension cord with my room space heater? I have a small space heater in my bedroom so I stay extra warm when I sleep. The problem is the wall outlet is too far away from my bed and the electrical cord on the space heater is only about 3 feet long. If so, do I use the type of extension cord with 2 or 3 prongs? The small portable ceramic space heater has a thermostat so it shuts off when it gets to the set temperature. Will setting the temperature “not as warm” make it safer if I use an extension cord? ANSWER: DO NOT USE AN EXTENSION CORD OR POWER STRIP WITH AN ELECTRIC ROOM SPACE HEATER. IT CAN OVERLOAD THE CIRCUIT OR OVERHEAT THE EXTENSION CORD AND CAUSE AN ELECTRICAL FIRE. SETTING THE SPACE HEATER THERMOSTAT HIGHER WILL NOT MAKE IT SAFER. For safety, ALWAYS plug a Space Heater DIRECTLY into the wall outlet using the electrical cord on the space heater and NEVER use a power strip or extension cord. This is because a space heater, no matter what size, draws a high amount of electricity and can overload a circuit or overheat an extension cord thus causing an electrical fire. If possible, get a space heater that plugs DIRECTLY into the wall outlet. This way there is no electrical cord to trip on or that can become damaged and cause a fire. 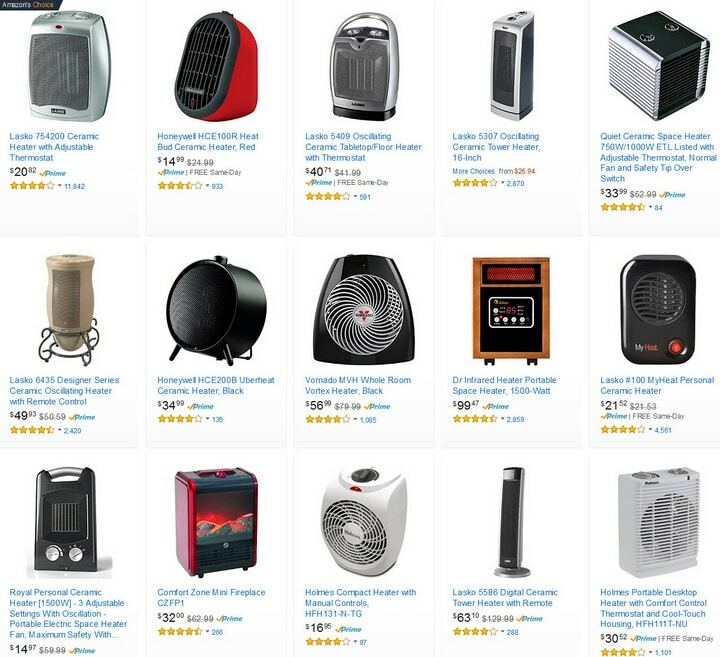 There are many different space heaters that plug directly into the wall that are highly rated and available online. – Besides the risk of the extension cord overheating and causing a fire, a pet or person could trip on the extension cord and the space heater may fall over therefore causing another fire risk. Also, if the extension cord is not plugged into the space heater tight and secure, this can also be a fire hazard. – If your space heater electrical cord is not long enough to keep you warm while you sleep, we would suggest either getting a new space heater with a longer cord, using your central home heating, or possibly having another electrical outlet professionally installed in your bedroom. – Any type of space heater whether whole room, personal space, oscillating, ceramic, or portable is an appliance that uses a high consumption of electricity. That means that a LOT of electricity is running through that appliance, its cord, and its electrical wall socket. Never use any type of extension cord and follow all safety precautions as 32% of fires are started by Space Heaters being misused. – Do not put a space heater on the carpet as this can cause a fire. Put the space heater on a sturdy table and closer to the edge of the table so the table does not get burnt. You can sleep with the space heater on at night, but run it all day in the room before you sleep to test it for safety reasons. Be sure the cord is not hot and that the space heater is in the right place. Using a surge protector is okay if you use the correct type. -If you use your space heater on a power strip or extension cord, you have a much HIGHER RISK OF FIRE. -Never use an extension cord on a any type of space heater. -Space heaters draw heavy amperage and should always be plugged directly in to the electrical wall outlet. 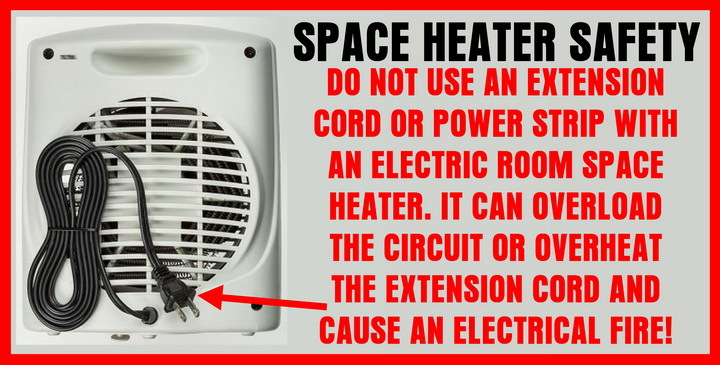 Special Note: Some people do use “Heavy duty extension cord for space heaters” and say it is safe as the extension cord is a “heavy duty” type. We DO NOT recommend this as even the heavy duty extension cord may GET HOT and cause a fire risk. If you do try this, test to be sure the extension cord itself is not getting HOT. As stated, we do not recommend this, but if in a desperate moment (central home heater goes out, extremely cold weather) it can be done but not recommended for safety reasons. 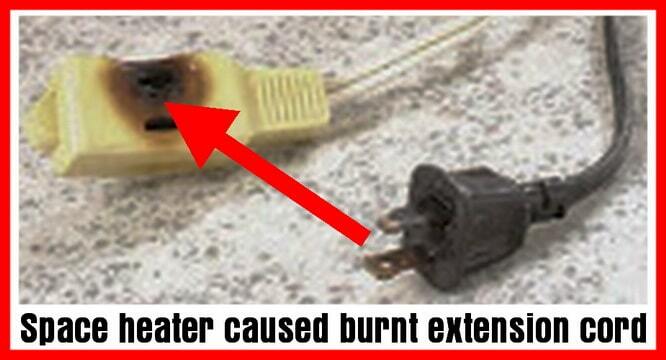 Please understand the risks involved with using ANY extension cord with a space heater. If you are not aware of wire gauge, and what the maximum amp rating of the extension cord you are using is… or the amp rating of the space heater is, you should not plug a space heater into the extension cord. NOTE: A thicker gauge wiring on a space heater is safer to use but there are no guarantees it is safe unless you truly know the space heater safety ratings, amp ratings, and wire gauge requirements. Electrical plug gets hot on portable space heater. 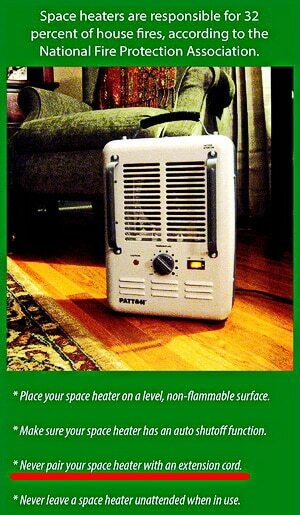 Have questions about using a space heater with an extension cord? Please leave a comment below and we will be happy to help you. Thank you for the information regarding using extension cords for your heater. I had been doing that and realize to my horror that I risked a fire in my home. I was using a heavy duty extension cord thinking it was 100 % safe only to learn it is not really. Thank you a million times for your article on this subject. You gave life saving information. Previous post: Refrigerator Has Water Under Drawers – What Is Causing This – How To Fix? Next post: Dishwasher Is Noisy During Drain Cycle – What To Check?